Be aware that these thing can cost either time or money, and in some cases, it may be both. This is an important issue that many seem to deem as unimportant, but will help any freelancer be more efficient and produce high-quality outputs. We are going to look at some of the basic things that all freelancers will need; things that, even if you have to pay for, are worth the cost. One of the biggest priorities of working freelance is the allocation and management of time. This includes personal time (your life outside your work) and business time (billable hours). You may have heard this before, but it’s worth repeating here: It’s important to keep your work life and your personal life separated, especially if you work in an environment such as your home where it’s difficult to establish clear boundaries. An unbalanced life can cause friction between loved ones, not to mention reduce your motivation to work. One way to help you manage your work time is to use a time-tracking tool. This is also very important in order to keep track of billable hours for invoicing purposes. In addition, if you’re an analyst, you can mine this data later on to gain insights into your work processes. You can, for example, identify things that take up too much time or determine more accurately how much to charge for a certain job based on the average time it takes you to complete similar jobs. You could use what I call the old school method, which has worked brilliantly for me in the past. Quite simply, you write down your tasks in a notebook and manually keep track of how much you spend on them. This is a handy method, relatively cheap, and gives you a simple overview of how much time you are spending on a project and what to charge a client. On the other hand, it is not as efficient as computer-based programs or web apps, it is quite repetitive and it also means you need to do a few calculations manually. And then, what if you lose your notebook? All that data, gone in an instant. 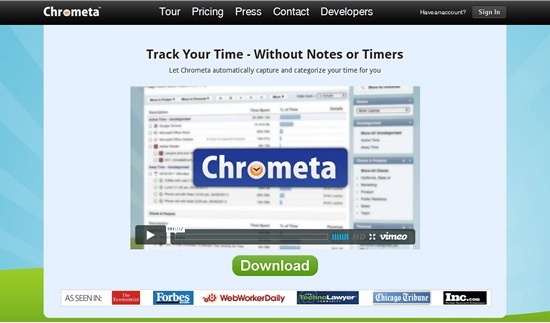 Time-tracking software is reasonably priced. Even if it saves you a few hours a month and improves your workflow the tiniest bit, it would have already paid for itself in spades. You should consider some desktop-based solutions such as Chrometa or QuickBooks (QuickBooks requires an additional add on for time-tracking since its primarily an accounting app). They range from free to a relatively low cost alternative. A web-based solution to time management is a very good idea. My personal favorite is FreshBooks, though there are many others that are just as capable and may work better for you. FreshBooks supports things such as customized reports, email integration, shared notes, invoicing, and an interactive timeline display. There is 1DayLater, an efficient and friendly program with an easy-to-use UI that also includes expense management for things like stationary or mileage logs. Another good web-based solution is 5PM, self-described as "an intuitive web based project management tool." It doesn’t matter what your profession is, everyone needs a good way to process his or her accounting needs, especially when tax time comes around! You can use software or web-based solutions in conjunction with your accountant, or you can DIY by simply using basic accounting and software to do your own taxes. The former is by far the easier solution and the most cost- and time-effective. QuickBooks is a premium and extremely popular accounting solution with a vast array of features that are powerful and simple to use. There is also a web-based version that can work in conjunction with the desktop version or standalone. Either way, you still get the best of the system’s features. 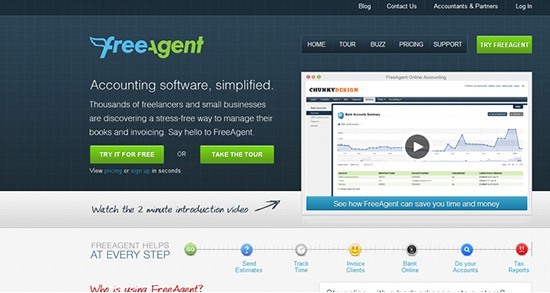 FreeAgent is an amazing web solution for accounting. Used by thousands of freelancers and small businesses, it provides a stress-free way to manage books and invoicing. This software allows you to send estimates, track time, invoice clients, bank online, do your accounts and even perform tax reports. The type of software that you will need is dependent on your chosen career. For example, a freelance writer most probably wouldn’t need Adobe After Effects. In any event, look at your professional field and identify industry-standard tools that are critical for your success. Adobe Creative Suite (CS) is a software package that includes Adobe Photoshop, Fireworks, Illustrator, and more. When coding, it is important to pick a code editor that suits your needs. It’s impossible to identify industry-standard tools in this profession for several reasons. First, there is a wide array of languages. Secondly, developers are builders by nature, and so this has led to a wide selection of tools available at your disposal. So I suggest participating in online communities to gain insights on tools that might work for you. For example, many Rails developers using Mac OS have traditionally preferred TextMate, but, still, you might find Rails developers that choose another text editor or go with an integrated development environment (IDE) instead. Below are a couple of my personal suggestions. For front-end development, Coda is another option. It’s a one-window web development software. There are other essential apps that you should have access to; they’re useful and, in many instances, a requirement for interfacing with clients and other freelancers. 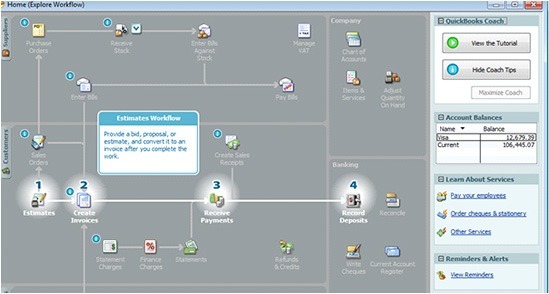 An office suite is a collection of productivity applications. Basic components of an office suite include word-processing, spreadsheet and presentation software, and often, an email client. Microsoft Office has traditionally been the most popular, and it comes with Word, Excel, and PowerPoint. 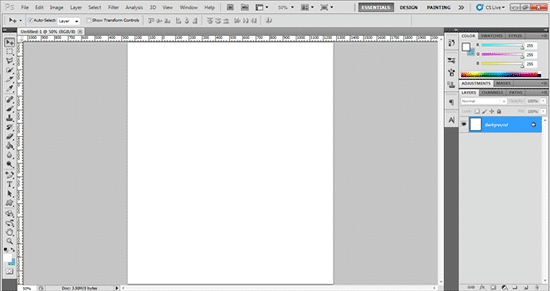 Open Office is an open source office suite that has software similar to Microsoft Office. For a web-based solution, Google Docs is an excellent option. It’s especially good for collaboration since your documents are regularly synced. As a freelancer, your computer files and documents are your primary business assets. Just as a brick-and-mortar store might takes care to protect their physical properties with insurance, security guards, surveillance cameras, etc., so should you with your digital properties. There are many backup and storage options out there. Picking one that’s web-enabled gives you the ability to use multiple computers with ease and with little fear of your backup device failing. One of the storage solutions you’ll often hear being mentioned is Dropbox. It’s free up to 2GB, and upgrading to 50GB (25 times the storage capacity of the free version) will cost you less than $200 a year. What’s great about it is that it’s seamless. Once you install it and save your files in your Dropbox, it automatically syncs and backs up your files so you don’t have to think about it much. As a freelancer, emailing is important. Whether it’s for sending a monthly newsletter to your clients, reaching out to blogs with press releases or offering email marketing as a service to your clients, it’s not a bad idea to have access to an email marketing tool. Campaign Monitor is used by many to send newsletters and email campaigns. MailChimp is also a popular option, along with VerticalResponse, Constant Contact, and many more. There are a number of books available out there that can give you a head start in your freelance career. I’ll suggest a few of my favorites. How To Be A Rockstar Freelancer. Written by the inspiring duo, Cyan and Collis Ta’eed, it provides practical advice on difficult situations. They teach you not to make the same mistakes they made in the past and the book includes a section on how to manage your budget. Freelance Confidential. Yet another magnificent piece of published art from those wonderful people over at Rockable Press. 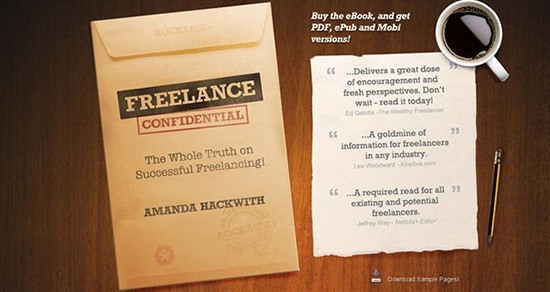 The author Amanda Hackwith has compiled what is considered the secrets of the freelance trade all in one book. Through the use of surveys, statistics and interviews, we get an overall insight into the world of freelancing, showing all of its ups and downs. The Principles of Successful Freelancing. A book from SitePoint that walks you through the transition from being an employee to becoming a fully-fledged freelancer, it also offers an education outline on the business of freelancing and also covers the emotional aspects. It’s packed with advice and tips to help you get started. Every freelancer must consider investing their time or money to become successful in the profession. A lot of software and advice out there are free, so search Google, read blogs, and most importantly, learn from your own (and from other’s) mistakes. This way, you will be able to avoid what has plagued other freelancers in the past, giving you a leg up into the world of working for yourself and always keeping you on the right track. One thing that you must keep in mind when freelancing is that you must be ready to invest some of your income into your own career. The concept of investing your hard-earned income is a scary thought, but at the same time, you’re investing it in yourself and your business.